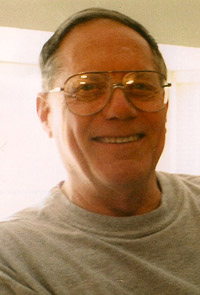 Art Ward moved to Colorado from Oklahoma in 1958 at age 18. Soon after, he became a feared street racer behind the wheel of his two hot ‘57 Chevys. He and his friends would hang out at drive-ins looking for races. In 1959 Ward graduated from the streets to a track in Scottsbluff, Neb. There, he won his class and the “King of the Hill” shoot-out against a dragster in his ‘57 Chevy, which he then drove at Continental Divide Raceway and Thunder Road for the rest of the year. In 1962, Art teamed up with owner and former driver Roger Guzman and starting in 1963 the two set record after record at a number of drag strips with a 1951 Anglia and then a 1939 Willies in the B/Gas class. 1966 was the year when Art first sat behind the wheel of the Guzman 1968 MG, powered by a blown, big clock Chevy named “Assassination.” Competitors called the car “Killer Car” because of the car itself and Ward’s driving talents. Ward won the Indy NHRA Nationals in 1966. The following year, Ward posted a 95 percent win record while setting a National record of 9.44 seconds, 139 miles per hour for the quarter mile. “Assassination Too,” a 511 cubic inch supercharged Corvair Funny Car came on the scene in 1968. Guzman provided Ward with a car he would drive to back to back wins in California, winning the Nitro Championships and setting track records almost everywhere he went. 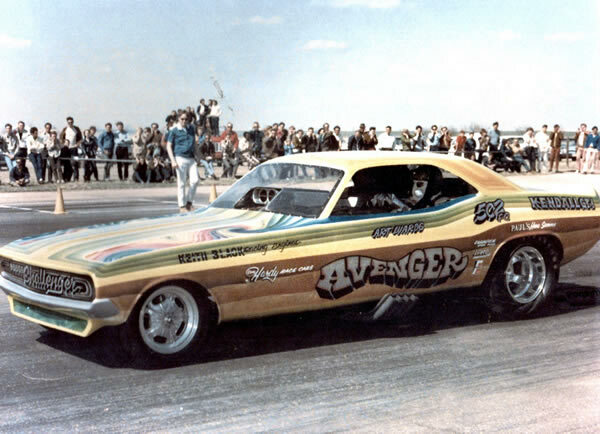 Ward took 1969 off, returning the next year to drive the “Avenger” Funny Car Mustang, when he partnered with Jack Bradley. In the next few years he set several track records, became the Rocky Mountain Funny Car champion and won the AHRA Funny Car Nationals at Century 21 Speedway, topping 204 miles per hour on one of his runs. In 1975, Ward again joined with Guzman and in 1976 won the NHRA Division 5 Funny Car Championship. He tried his hand at driving a top fuel car in 1977 before retiring in 1978. During his drag racing career he had run against the best there was taking his share of victories. Unfortunately, several years ago, Ward lost his battle against his toughest opponent of all, cancer. Eddie Jackson, a Colorado native, started his racing career in 1951 driving stock cars at Englewood Speedway. He raced there through 1955. 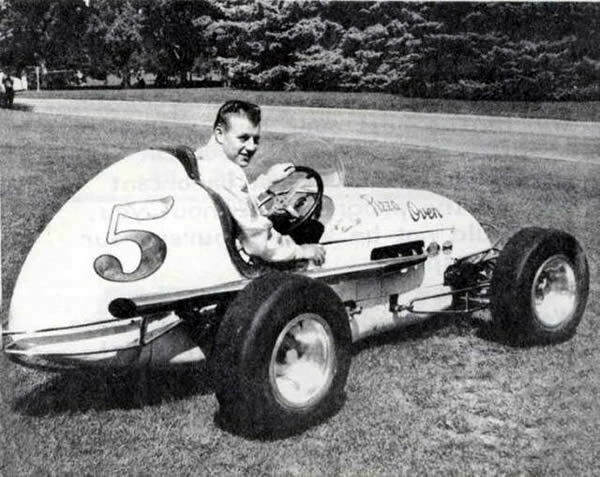 In 1956, Jackson purchased the famed Number 5 midget race car from Lloyd Axel. Doing all of his own mechanical work, both engine and chassis, he scored his first feature win that same year at a Colorado Auto Racing Club midget race at Lakeside Speedway. Eddie passed his driver’s test at the Indianapolis Motor Speedway in 1959, driving a car owned by Denver’s Bus Osborn. He was scheduled to run the car, later in the year at Milwaukee, but was seriously injured in a race at Peoria, Ill., and hopes on an Indy car ride were gone. Jackson returned to Colorado and won his first Rocky Mountain Midget Racing Association championship in 1960, followed by championships in 1962 and 1963. He then joined a new midget racing series at Englewood Speedway, which eventually failed. In 1967 he was once again running under the RMMRA banner. He had sold his car to Vern Shaver then as Shaver’s driver, won championships in 1967, ’68 and ’70. Highlights of Jackson’s career included winning the inaugural Belleview Midget Nationals in 1978, the Intermountain Midget Championship in Salt Lake in 1958, the Houston Midget Grand Prix in 1980 and the Big Car Racing Association Championship in 1963. He scored 77 feature wins in RMMRA events and drove for a number of notable car owners, including Vern Shaver, Harry Conklin, Chuck Mauro, Ray Koch, and Frank Peterson. Eddie was very badly injured in a midget race in Las Vegas in 1982. He never fully recovered and passed away in 1983. Mark Williams began a lifetime involvement with drag racing in the late 1950s owing and driving an Olds-powered ’34 Ford coupe. By 1960, he built and drove his first dragster primarily made out of old drive shafts. A trained machinist, Mark worked for John Bandimere, Sr., developing new products, but decided that building race cars was what he really wanted to do. He joined forces with friend Ron Bement and built a contemporary dragster which was sold to Hall of Famer, Roy Golightly. He took the profits from building that car and invested in the equipment needed to open up a race car building operation of his garage in 1963. Mark built many cars that dominated their classes in NHRA Division Five events. His cars run by Bill Rice and Larry Frazier won numerous races and championships. Perhaps the most famous of the cars he built was the rear engine top fuel dragster campaigned by the Kaiser brothers in the early 1970s. This was considered to be the blueprint for rear-engine revolution of today’s top fuel cars. In 1985, the last race car to come out of the Williams’ shop was a top Alcohol Dragster owned by Vern and Brian Raymer. By this time, Mark had built an estimated 150 cars. Today, Mark Williams Enterprises sells blueprints and component kits for a variety of drag racing machines. The best known of the products he manufacturers and sells are forged, hi-torque racing axels, first used by Hall of Famer Judy Lilly. Other products include disc brakes and drive shafts. His manufacturing processes are technically the best available and he has an extensive research and development department. Windy Windholz was born in Kansas in 1923, the youngest of 15 children. In 1943, he was drafted into the Army Air Corp. and was sent to Aviation Mechanic School. One of Windy’s World II assignments was to work on a top secret aircraft later to become known as the B-29 bomber. Discharged in 1946, he came to Denver to find employment and a co-worker took him to the track in Brighton to see a hot rod race. That was all that was need to start Windy on the track to a long and successful race car owner career. By September 1946, he finished building his first race car, a 1930 Model A Roadster powered by a twin ignition, six cylinder Nash engine, known as the “Go Nash number 30.” Married in 1947, his wife Sandy would become a constant companion and supporter of his racing endeavors. When Englewood Speedway opened the same year Windy was there with his hot rod, one of his drivers was Don Codner, whose father, Charlie, would later buy the track. Windholz ran hot rods until the late 1940s. He then partnered with Curt Stockwell and they would field Pikes Peak Hill Climb cars for 16 years as well as sprint cars until the mid-1960s. When Colorado National Speedway opened Windy decided to run late models on the dirt. Unable to get his favorite number 30 he decided to run number 101 on his car and that number along with the color purple became his signature. Windy’s cars appeared at opening races at Englewood Speedway, Century 21 Speedway, Raceland Speedway, Rocky Mountain National Speedway and Colorado National Speedway. He won championships in 1970, ’71 and ’72 at Colorado National Speedway and 2005 at Rocky Mountain National Speedway. For over six decades, Windholz has fielded hot rods, Hill Climb cars, late models and modifieds. He was a founding member of the BCRA and a member of the RMMRA and CARC. Allen Batt, Paul Garrison, Ken Lowe and Eric Pfiff are just some of the talent to have driven his cars. Windy passed away in 2010. A native of Colorado, Junior Kaiser grew up in the Washington Park area of Denver. He attended his first drag race in 1955, at age 16, at Lowry Air Force Base. Like many, he was first a street racer cruising the streets and drive-ins looking to take on anyone with his Henry J powered by a V-8 Chevy. After his brother Jerry totaled the Henry J, he took its engine and put it in a 1927 Model T Coupe. In 1958, he built a top fuel dragster powered by a 389 cubic inch Pontiac engine. Junior and his dragster showed up at Continental Divide Raceway in 1960 and won a top eliminator title defeating Hall of Famer Roy Golightly at a speed of 134 miles per hour. He continued running top fuel at CDR before moving to California. With the help of his brother, he raced at all top California drag strips running most every weekend. Returning to Colorado several years later, they put a GMC 671 super charger on a Pontiac engine in their top fuel car. 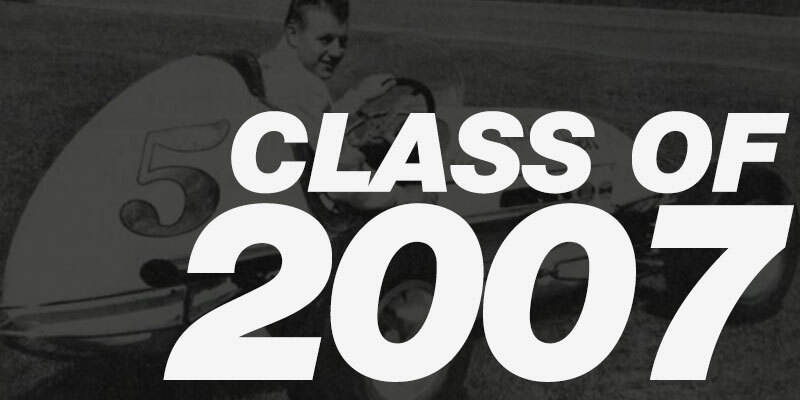 Junior became one of three Colorado drivers to go over 150 miles per hour in 1962. Junior opened his own high performance engine machine shop, Kaiser Enterprises, Hi Pro Engines. It is now owned and operated by his son, Troy, and his daughter-in-law. Bill Hill was born in Kansas City, Missouri in 1930. Before coming to Denver, he served as a Paratrooper with the 187th Airborne Regimental Combat Team from 1950 to 1953 and is a Korean War veteran. He then attended the University of Illinois working on majors in Journalism and Business. Arriving in the Mile High City in the late 1950’s, he became a sales representative for several large national companies. He served, for a brief time, as public relations director for J.C. Agajanian Enterprises in 1966, before becoming the Rocky Mountain Regional Sales Manager for a national cosmetics company. In 1972 his motor sports career really began when he became the assistant news director for the United States Auto Club. Previously, he had announced at a number of race tracks in the Denver area, as well as tracks in New Mexico, Nevada and Oklahoma. He also served as PR director for the Pikes Peak Hill Climb and several Denver area race tracks and racing organizations, as well as hosting several radio shows in Denver. In 1973 he joined Don Smith Enterprises, a very successful racing promoter. There he worked on administration and race-day operations for the company. He also handed publicity for the Terre Haute Action Track and the Indiana State Fairgrounds’ racing events. In 1982 he became General Manager of the Devils Bowl track in Houston and then moved on to be public relations director and promoter at the Tulsa and Muskogee, Oklahoma race tracks. He did the PR for the first World of Outlaws race staged in Dallas in 1978. In 1985 he formed his own company, Bill Hill Productions, which provided PR and promotional services for a number of race tracks across the country. He then became a Senior Account Representative for K&K Insurance and then a Risk Manager for Las Vegas Motor Speedway and Pikes Peak International Raceway until his retirement in 1995. Bill has also written and published two outstanding books on racing, Midget Racing in America’s Heartland and Midget Racing in the Rocky Mountains. He was inducted into the National Sprint Car Hall of Fame in 1995 and also sits on the organization’s Board of Directors. Sonny Coleman saw his first midget race at Lakeside Speedway in 1942. Little did he realize he would be driving at that track a few years after World War II. Like many others, Sonny built a street roadster and went looking for street races. Harvey Wilson was impressed enough with Coleman that he invited him and his car to race in 1947 at a track in Brighton. Coleman’s car ran poorly in the B class so he built a new race car, that while was faster, also put him in debt. While working at the 9th Avenue Motor Service, he met driver and owner Leon Hawks and served on his midget racing pit crew. It wasn’t very long before Sonny told Hawks if he couldn’t drive better than he had he should park the car. Hawks then put Coleman in the car. That was the start of Coleman’s midget racing career. Hawks worked so many hours that he let Sonny take charge of the car, trailer and tow vehicle so Coleman could run the midget wherever he wanted. Leon’s wife was appointed to manage the team. 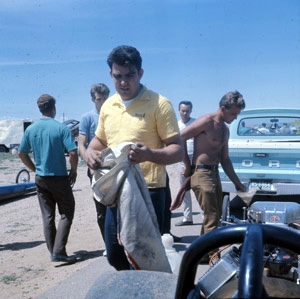 Sonny started running with the Colorado Midget Racing Association series at Englewood Speedway, scoring two feature victories in the Hawks’ V-8 60 powered car. Returning to Lakeside, Coleman received invaluable input from Miles Spickler and Roy Bowe. They would help set up the midget. In 1950 Coleman took the famous Kenz and Leslie V-8 60 midget to the Rocky Mountain Midget Racing Association Championship, battling Roy Bowe right down to the wire. He finished fourth in the standing in 1951 in the same car. He drove to 12 RMMRA feature races during his career. 1954 Coleman’s career came to a close when he was badly hurt after a radiator in the three quarter midget he was driving exploded. Buddy Shay was born in Ohio but spent most of his formative years in Indiana. His older brother, Vic, bought a midget race car and decided to take it to races in Kansas City and Denver. In 1939 Shay left Indiana, worked in Chicago and then went to visit his brother in Denver. Then, he decided to stay in the Mile High City as he had already made up his mind he wanted to drive midgets. In his first ride, Shay qualified last and finished last in every race we was in, but he stayed with it and was much improved by the end of the season. In 1940 he bought what he called a junk yard special, a V-8 60 with a model T frame, for $160. He found out that an Arizona promoter was paying appearance money of $7.50 a week so Buddy was off to Arizona along with Vic. Shay got ride in another car so Vic drove Buddy’s machine and they did well enough that they stayed there for about a year. In 1941, Buddy bought a midget chassis and with several friends tried to put a V-8 60 engine in the car, but it wouldn’t fit unless they put it in upside down, so that’s what they did. After solving a multitude of problems they finally got it to work. It looked weird but handled and ran well. The car was featured in a recent edition of Speed Sport News. Unfortunately, Vic was fatally injured when we wrecked that car in July 1942 at Lakeside Speedway. Shay was in the Army Air Force during World War II, returning to Denver and midget racing after his discharge. In 1946 Buddy drove a car that sometimes he owned and sometimes Ray Koch owned. By 1947 the car, totally renovated, provided Shay with his first three feature wins. In 1948 Buddy was assigned the Buzz Bussard Offy-powered car and won at least 14 main events in it that year and also ran against the best there was at Soldiers Field in Chicago. 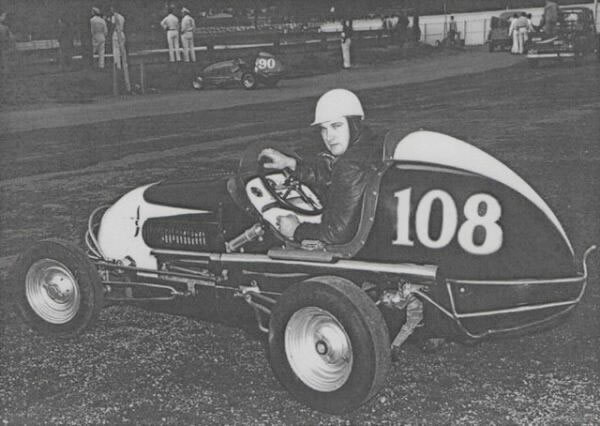 The then drove for Morris Musick for the next two years, taking seven feature races, including the last three races at Lakeside Speedway in 1950. Returning to the Bussard midget in 1951, he finished second in a tight and disputed contest for the RMMRA Championship. Shay won two features at Denver Midget Club events in 1952. Before retiring in 1954, Buddy won 30 feature races under the RMMRA banner alone, not counting many others under different banners. 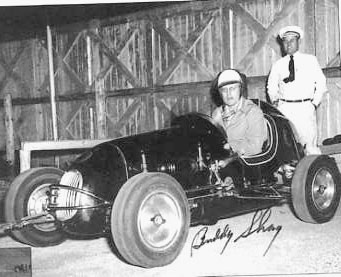 Track announcers couldn’t pronounce Buddy’s last name, which was Schey, so early on he changed it to Shay. Whether it was an asphalt track or dirt track in Colorado, Arizona, New Mexico, Utah and numerous other states, Shay was a winner wherever he raced. Born in Colorado, Johnny Pachello was the oldest of nine children and as he grew older he participated in working at the truck farm his parents, second generation Italian Americans owned in Arvada. He still retains four acres of the original farm. Although he is officially retired from racing, he still enjoys building engines and is considered one of the top flathead V-8 experts in the country. From 1946 to 1951, he worked on a midget race car before entering the U.S. Army. While serving in Korea, Pachello was awarded the Purple Heart. Returning from the Army in 1954, Pachello opened his own automotive repair shop and partnered with his cousin, Tedo Spano, in running modifieds and late models. One of their cars won the track championship at Longmont Speedway. In 1959 Johnny purchased Spano’s part of the team and built his own modified race car, the first to carry the famous number 19. Eddie Jackson was assigned to drive the car in 1960, but because of other racing commitments, Jim Malloy replaced him in the car. It was this year that Pachello’s car won the first of 14 championships. Starting in 1961, Donny Wilson drove Pachello’s car to Lakeside Speedway championships in 1961 and 1967 through 1971. Wilson also won the Wyoming Championship in Johnny’s car in 1961. He returned to the #19 car to win yet another Lakeside championship in 1976. Driver Jack Graham won Lakeside championships in the car from 1973 through 1975 and Terry Daniels chauffeured the Pachello’s car to three more championships from 1980 through 1982. Johnny always took great pride in the number 19 car and it won a number of best appearing car awards. His superb mechanical skills delivered him many “mechanic-of-the-year” honors. Pachello retired number 19 in 1983 at it sits in his garage today just as it came off the track after its last race. But, Johnny’s impact on racing was not over; to everybody’s surprise, he joined Rick Carelli’s pit crew and built engines for Carelli that won him Lakeside championships in 1984 through 1988. Johnny Pachello’s race cars have set winning records that no other car owner was able to achieve.